Consultative Selling leads to the Best Buying Experience by aligning sales and marketing with the Customers Buying Process. This helps focus the alignment of Sales and Marketing to identify and discover your customers compelling needs. One of the first steps is the creation of sales and marketing core messages built on How Individual B2B Buyers Meet Their Needs. These types of messages allow customers to clearly visualize how your product and service usage will help them achieve their business needs. Using these core messages as building blocks. Your personnel can use Consultative Selling Skills to help identify the individual needs of the people they meet. These, and other behaviorally correct skill sets, allow your personnel to help develop a Vision of a Solution, based on value, in the mind of the buyer-customer. Our clients tell us it is the ability of their personnel to identify and align with the Shifting Concerns of Individuals Making Buying Decisions which is helping them increase sales. Our clients want their personnel to use consultative skills to assist customers in developing a Vision of a Solution. Helping you understand the WHAT/WHY. Yet more importantly, the HOW and WHEN in buy-sell relationships has been the underpinnings of our sales training and education since 1998. In this way we help clients be perceived by their customers in a highly differentiated way. Current research by the Aberdeen Group demonstrates the key is to focus with customers on their buying process and needs. Helping them create a Vision of a Solution as to how the capabilities offered will help them solve their compelling needs. We help organizations of all sizes, and in many industries, increase sales and profitability. Those thoughts miss what is important to Buyers. Buyers want to have the Best Buying Experience. The beginning of the Best Customer Experience. They may have goals or they may have problems. 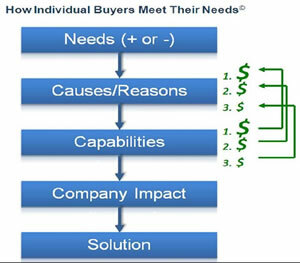 The key in Consultative Selling is to understand their NEEDS, positive or negative. Helping them have a great buying experience no matter how long their buying cycle may take. It is not good enough to be a consultative sales person; we also need to be a buying facilitator. We educate and train your personnel to stay in alignment and "sense" where each individual prospect is in their buying cycle. Using behaviorally correct skills to connect and build trust at first contact. While using the power of story with visual messaging around product and service usage. To help new and existing customers develop a Vision of a Solution which includes your companies capabilities for their market or industry. 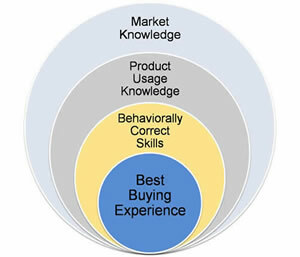 The Best Buying Experience is a combination of Behaviorally Correct Skills, Product Usage Knowledge, and Market Knowledge. From the customers' perspective, Consultative Selling can create the Best Buying Experience. The difficulty in becoming proficient at Consultative Selling. It is not enough to ask good questions, listen and focus on needs. We need to first gain trust and stay aligned with our buyers shifting concerns as they are making buying decisions. In addition, we need to demonstrate behaviorally correct skills though out the buy sell cycle. By sensing where the customer is in their buying process, we help your sales people discover compelling needs based on unique solutions your company has to offer. Aligning Consultative Sales & Marketing with a Customer Focus helps lead to win-win outcomes with customers. Increasing sales and profits for both you and your customers.